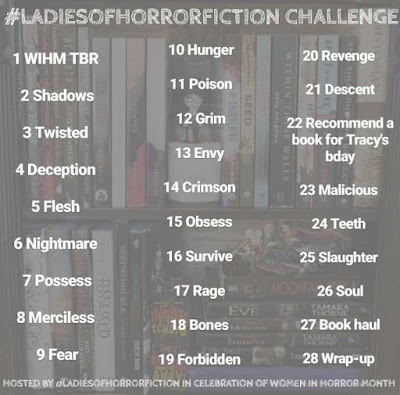 We are doing another #LadiesofHorrorFiction photo challenge on Instagram if you'd like to join in on the fun over there. 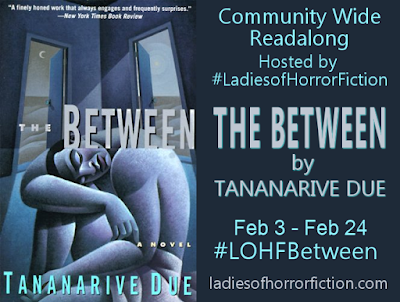 We are also hosting community wide readalong of The Between by Tananarive Due. Be sure to check out the full readalong schedule. And be sure to hang out with me here all month as I review and share horror books written by women. If you post any #WiHM reviews this month, be sure to let me know so I can share those, too! I posted my ⭐⭐⭐⭐★ review of Down Among the Sticks and Bones by Seanan McGuire. I also finished reading Exploring Dark Short Fiction #2: A Primer to Kaaron Warren edited by Eric J. Guignard ⭐⭐⭐⭐⭐. Stay tuned for full reviews of both this month. 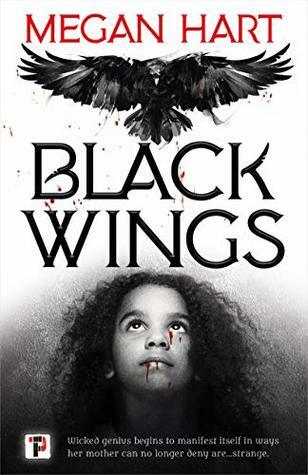 My current Women in Horror Month read is Black Wings by Megan Hart. 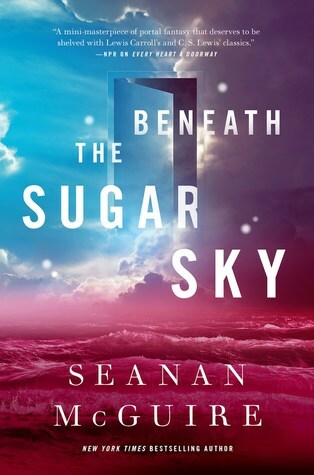 I'm also reading and enjoying the next Wayward Children book Beneath a Sugar Sky by Seanan McGuire. Many thanks to Tor.com for sending out Middlegame by Seanan McGuire, Finding Baba Yaga by Jane Yolen, Bedfellow by Jeremy C. Shipp. 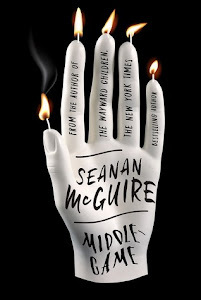 Middlegame is Seanan McGuire's upcoming release due out on May 7, 2019. The Jane Yolen book is a Baba Yaga book written in verse! What a perfect book for me! 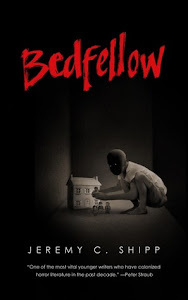 I also excited to check out the "tense dark fantasy novel of psychological horror" Bedfellow. 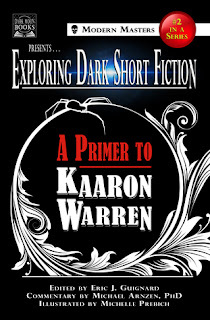 Thank you to DAW for the Kindle ARC of Finder by Suzanne Palmer. I'm looking forward to this action packed scifi novel. 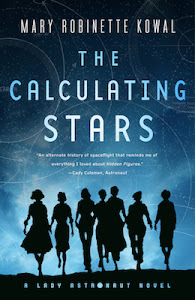 I also grabbed a couple Audible deals this week that I'm excited about: The Calculating Stars by Mary Robinette Kowal and Trail of Lightning by Rebecca Roanhorse. So what about you? Let me know what you're reading this week or leave me some links! This post is being shared as part of Book Date's It's Monday! What Are You Reading? and Caffeinated Book Reviewer's The Sunday Post. 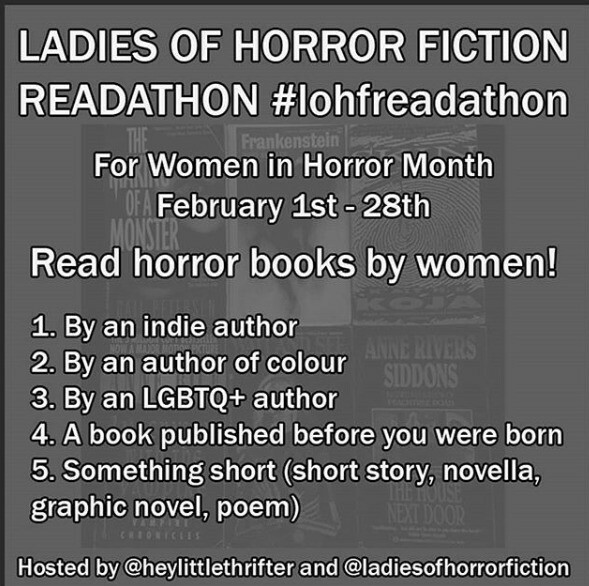 This is our first year doing the readathon, but it coincides with Women in Horror Month in February! Some great plans - I didn't know there was another #LadiesofHorrorFiction month planned. I don't do Instagram but I can still check out the Twitter feed. You've got some excellent looking books to look forward to - I definitely recommend Trail of Lightning. I was terrible at announcing all of the things here ahead of time! I'm looking forward to *finally* reading Trail of Lightning. I'll have to check out Ladies of Horror. Sounds fun. Your books look great. Enjoy them! Seanan McGuire is an author that I really need to give a try! I'm enjoying her work right now. 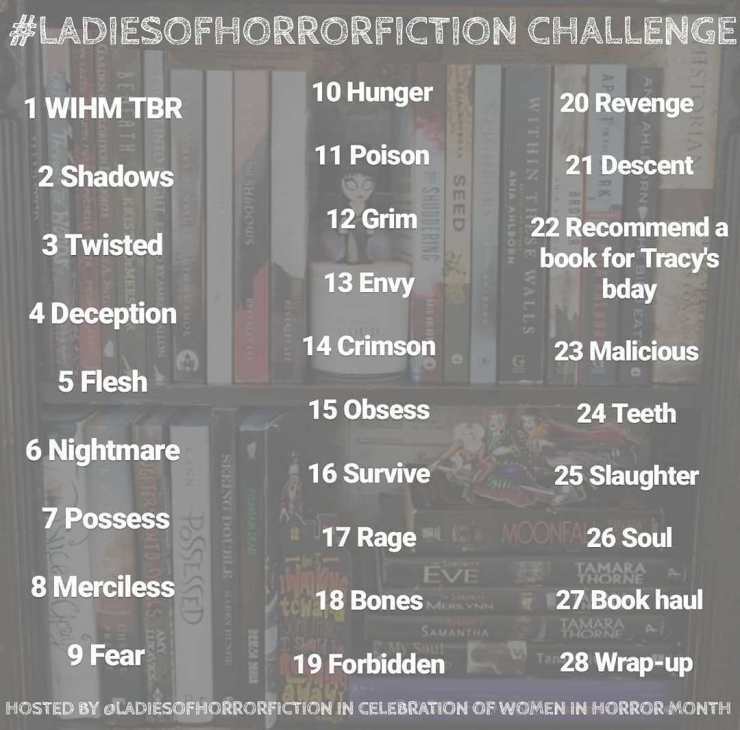 that is very cool that you are doing a women in horror challenge. Good luck! Oooh! The ladies of horror month sounds interesting!! I got to check it out! This sounds like a fun event! If I didn’t have so many unread books sitting around, I would have looked for some horror by women. I don’t think I have any horror on my shelf right now because I tend to read them quickly. I need to be better next year about talking in advance! Ooh that photo challenge looks fun. :) And Trail of Lightning looks amazing. I need that one. 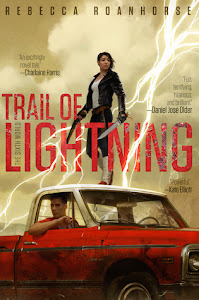 I'm excited to finally read Trail of Lightning. The sequel is releasing soon, too. I didn't know women in horror month was a thing! I think I'm going to have to find some good books to read! Yeeess! Join in if you can! Enjoy Trail of Lightning! I read that one in book form, but I think it would be amazing in audio. 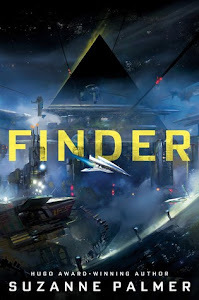 Also looking forward to Finder, even though I only learned about it recently when a review copy suddenly showed up. It sounds fascinating. I'm super excited about both. I'm hoping to get to Trail of Lightning before the sequel is released. We'll see! I'm a bit behind in my reading for this month already so I have to get a move on! I set my goal low so I'm always ahead this time of year. :) It's the summer time that makes me very thankful that I get ahead early. Thanks, La La. I'm enjoying that series a lot. I can't wait to read Middlegame. I'm excited to read it! It's a chunky one, though! I loved The Calculating Stars. I also like Jane Yolen's work. I need to read more by Seanan McGuire. I've enjoyed everything I've read so far but have so many yet to read. Come see my week here. Happy reading! So good to hear! I hope I can squeeze it in this year. What a cool month! That Jane Yolen book looks awesome. I have only ever read her kid's picture books - that one looks a little different. :) Have a great week! Everyone has such good things to say about her. I need to look into her work! I really enjoyed The Calculating Stars. I liked Trail of Lightning. I've reviewed both on my blog. I have wanted to read Jane Yolen since I heard her speak on a panel at DragonCon. Oooh, DragonCon sounds great. I need to look into Jane Yolen. Everyone has had such good things to say about her. 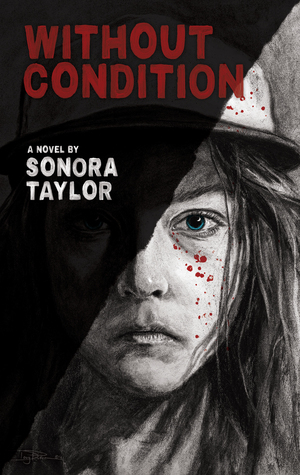 I have to start The Wayward Children Series. It sounds so good. I love that it is LOHF month. I hope you enjoy the challenge! Have a wonderful week of reading. Thanks, Mary! I'm enjoying each one of the Wayward Children books. They are worth checking out. 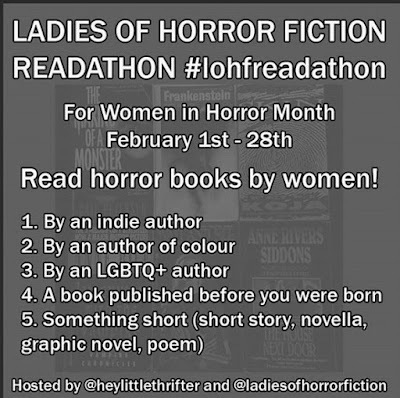 Good luck with the Ladies of Horror readathon. That and the Instagam challenge sound very cool. Thank you, Suzanne! I'm enjoying this month of challenges. 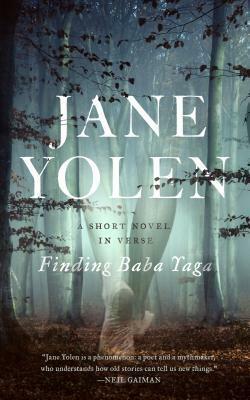 I really want to read the Jane Yolen book. I love Baba Yaga tales. So it seems you are liking the 3rd Wayward Children book? I don't know if she can top the second one for me. The only problem with the LOHF month is how many books I end up adding to my wishlist/TBR. I'm enjoying it. I will have a review out soonish. I can see why it wasn't your favorite, but omg, that ending in the frog pond with the water hand and the little turtle, etc, etc.... Loved that so much.